A compact Medlar variety, useful if space is limited. The wood, leaves, and blossom all have some ornamental value. Royal is considered to the best Medlar for eating fresh. Pick the fruits in late October and then store for 3-4 weeks. The flesh then has the soft consistency of a ripe fig or date. 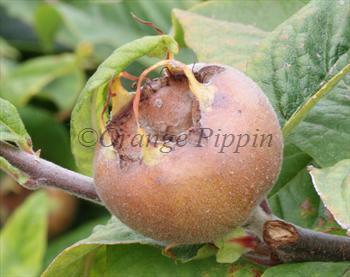 However like most Medlars it is best considered a culinary fruit, for use in jams and chutneys. Please fill in the details below and we will let you know when Royal medlar trees are back in stock. Pick in October then leave to ripen.? Royal is self-fertile and does not need a pollination partner, although fruiting may be improved if there is a compatible tree of a different variety nearby. Prefers a sunny aspect for best results.